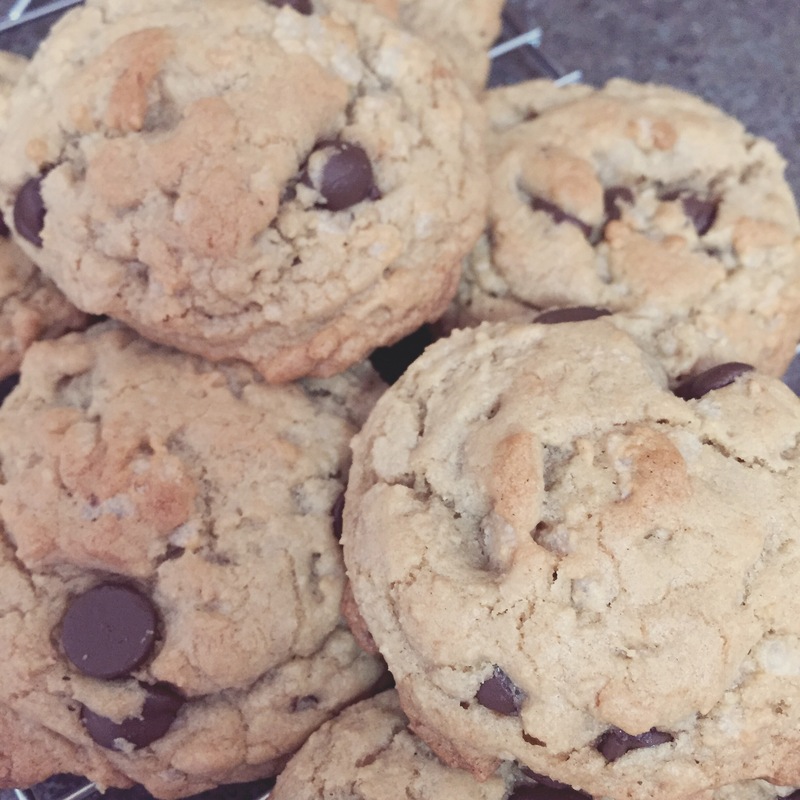 My favourite chocolate chip cookie recipe with the addition of Rice Krispies. The addition of Rice Krispies add a nice surprise texture. The Rice Krispies didn’t stay very crispy once baked but they did added a nice texture, almost a little chewy. Made for a nice surprise. In large bowl, beat melted butter, brown sugar, eggs and hot water until smooth. In medium bowl, mix together flour, baking powder, baking soda and salt. Stir into butter mixture until blended. Stir in milk chocolate chips and Rice Krispies. Be careful not to crush the Rice Krispies. Drop from cookie scoop onto a lined cookie sheet. Makes approximately 6 dozen cookies. This entry was posted in baking, recipe and tagged baking, recipe on July 27, 2015 by Courtnie. So I have made these four times in the past month or so. Getting them just right has been a little bit tricky, but they are really easy and super delicious. The first time I made these they turned out perfect, absolutely amazing and everyone gobbled them right up. The second time they didn’t rise and the third time… well I don’t even know what happened the third time. The fourth time I measured everything exactly and followed everything exactly and they turned out great again. So I suggest following the recipe and the measurements exactly and making sure you have a warm place to let them rise. They really are fast and easy and delicious when they turn out. This is defiantly a recipe I will be coming back to again and again. 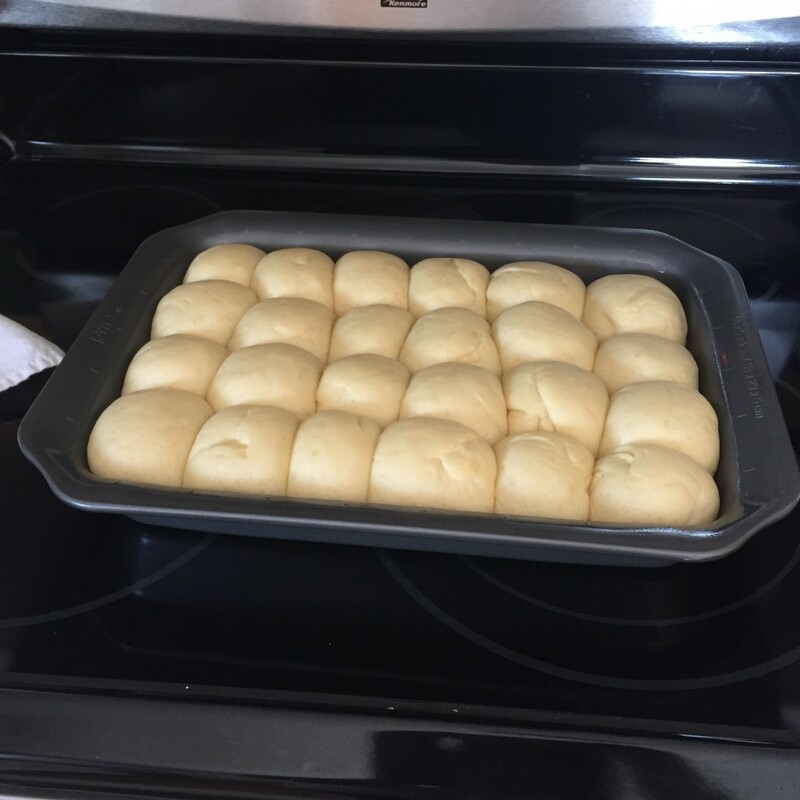 Makes 24 delicious homemade dinner rolls. Easier then going to the store and buying some! In a large bowl combine warm water with yeast and 1 teaspoon sugar. Set aside for 5-10 minutes. Using your mixer with the dough hook attached, combine butter, sugar, eggs and salt. Add in the yeast mixture and mix to combine. This entry was posted in baking, cooking, recipe and tagged baking, cooking, recipe on July 1, 2015 by Courtnie. I saw these on Add a Pinch and knew I had to make them, immediately. And they were worth it. So delicious. Side note: all recipes I have tried on Add a Pinch have been awesome. She has some great cake recipes! I doubled the recipe because I knew 20 cookies was not going to be enough. Plus, when was the last time a recipe actually made the amount of cookies it said it did – this one was actually pretty accurate. I ended up with pretty close to 40 cookies. Just a couple suggestions. Use less kosher salt or swap out for sea salt. The taste was delicious but I found they were too salty. At times you could really taste the salt. Also, don’t over cook. Some of mine were very hard. I cooked longer than recommended because I felt like they weren’t cooking – in reality they probably were done a lot sooner then I realized. After a couple days they did soften up. Much better when soft. So even if they don’t looked cooked take them out! I also used half the amount of chocolate chips and happy I did. I feel like the chocolate would have really overpowered the coconut if I had of used the whole amount. A HUGE plus for these (in my books) is that they use coconut oil. I buy my coconut oil in a HUGE container from Costco so these are a great way to help use it up. 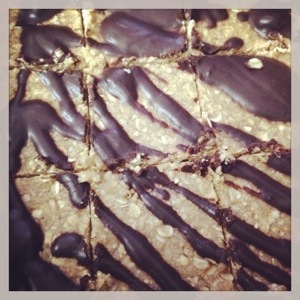 I will be making these again and probably again and again… once I get some more coconut oil. Preheat oven to 325º F. Line baking sheets with parchment paper or a non-stick baking mat. This entry was posted in cooking, recipe and tagged baking, recipe on June 26, 2015 by Courtnie. I miss baking. I miss eating my baking. Baking just takes too much time right now. Time I don’t have. For the last couple days weeks, I have been wanting to bake. Yesterday, I was looking up oat bars (like they have at Starbucks). My husband loves oat bars and I have a Costco amount of oats. When I came across this recipe I thought it was worth a try. First of all, it gave me a chance to use my Blendtec and second, it looked simple and fast – no baking required! They are delicious! They took me no time at all, I had the bars pressed into the pan within five minutes and the chocolate took a couple minutes longer. I think it actually took me longer to clean up the mess then actually make these bars. I used butter in replace of the coconut oil for both the bars and the chocolate, I wasn’t looking for a coconut taste but I think I will try it next time. I also used an 8×8 pan, I wouldn’t use the 7×13 they recommend, they bars would be pretty thin. The texture was different then Starbucks (less dry and crumbly, probably because of the no baking) but they were just as delicious. I don’t want to turn this into a cooking or baking blog but I had to share this recipe because it was so easy and yummy. Any quick, easy and delicious baking is a win for this new Mom. 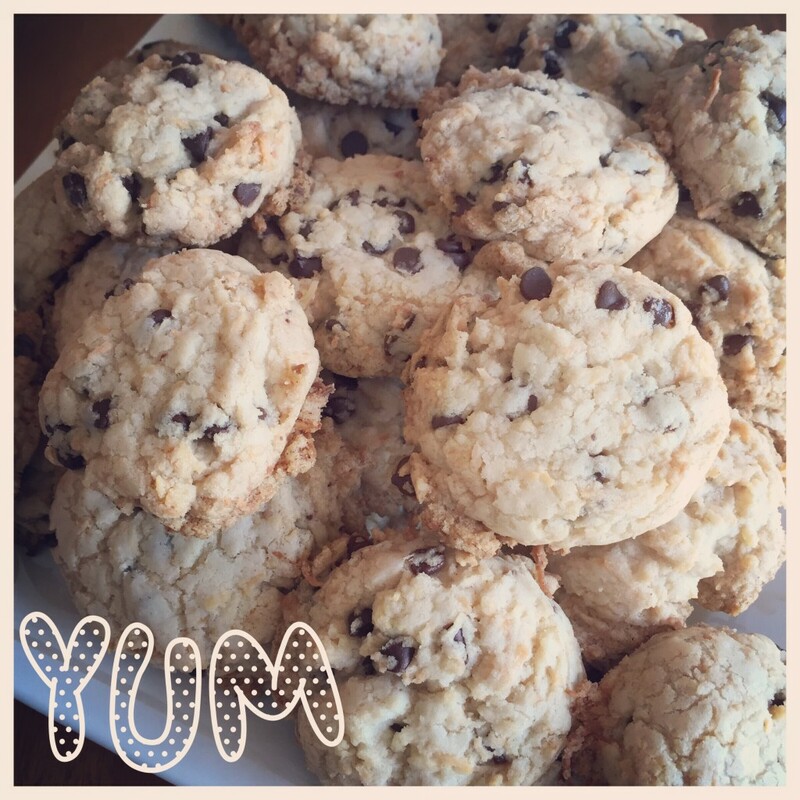 Update 7/7/2014 – I made these again today, this time I used the coconut oil and they were just as delicious. Just a slight coconut taste. I will defiantly keep making these, probably with the coconut oil as it is a healthier option. Husband says they are okay but “not Starbucks”. I also timed myself today, they took about 20 minutes from start to completely cleaned up. This entry was posted in baking, recipe and tagged baking, easy recipe, recipe on June 30, 2014 by Courtnie.